This guide began as a guide to the 7 Pines / Marion Mountain Trail Loop in 2007, but on 15 September 2011 we changed it to be a guide to just the 7 Pines Trail, after doing extensive work on the trails separately. The 7 Pines Trail is a 3.4 mile trail from the trailhead on the Azalea Pines Road just past the Girl Scout Camp to a junction with the PCT. The hike to the PCT and back is 6.8 miles roundtrip with a total elevation gain and loss of 2760 feet (2550 feet gain on the way up to the PCT and 210 feet gain on the way back). Directions to Trailhead. From the U.S. Forest Service office near the center of Idyllwild, drive 5.0 miles to Azalea Trails Road, which is the turnoff for Marion Mountain / Stone Creek / Dark Canyon Campgrounds, and turn right, across the street from Camp Allendale. After 0.1 mile, turn left to stay on Azalea Trails Road. After another 0.7 miles, turn left again to stay on Azalea Trails Road. Drive another 3.4 miles to a saddle just above the Azalea Trails Girl Scout Camp, following the road left after the horse corrals at the Azalea Trails Girl Scout Camp, immediately before the usually-closed gate to the Camp. Note that these left turns are somewhat confusingly signed; the first two are marked on the map below. It helps tremendously to expect these turns before you get to them. The parking area is on the right. Azalea Trails Road is paved through Dark Canyon Campground, and is dirt above that. 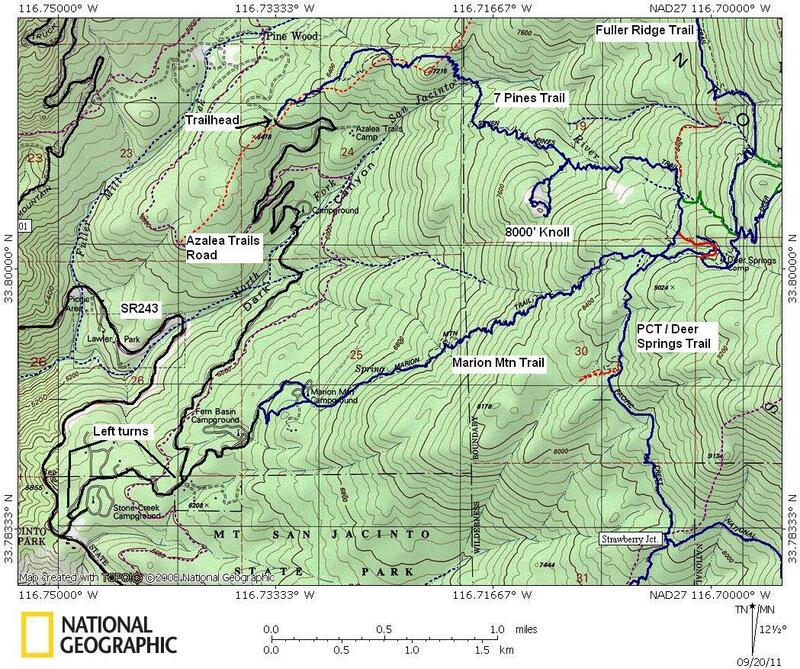 The following map shows the access road, parking area, 7 Pines Trail, and nearby trails. The Azalea Trails Road is much more windy than indicated on the map, and a slow drive. Anticipate taking a minimum of 25 minutes from Idyllwild to get to the 7 Pines Trailhead. This guide is different from our usual plant trail guides, in that it corresponds to the flora of an area rather than just a transect along the narrow corridor of the trail. The plants numbered below are not all on trail, and the number of plants reflects the number seen off-trail as well as on-trail, including an excursion to an 8000 foot knoll about 0.3 miles south of the trail. See also Flora of 7 Pines Trail Area, which gives all the species in this guide in traditional family order, cross-referenced to this guide. This trail can be done as part of a 6.1 mile loop hike, with 2530 feet of elevation gain and 2550 feet of elevation loss, that requires a car shuttle between the Marion Mountain Trailhead and the Seven Pines Trailhead. The one-way car shuttle takes about 15 minutes. Part of the shuttle route is a dirt road that can be easily navigated by high-clearance normal passenger cars. A very large number of species for a high-elevation trail. This guide contains 155 species as of 19 September 2011, whereas a typical high-elevation guide contains ~100 species. The 8000 foot off-trail knoll is the type locality of Potentilla rimicola, a RARE species found only at SnJt and the Sierra de San Pedro Mártir in Baja California. The original name given to the plants at this particular location of this species was P. wheeleri var. rimicola, with the type specimen collected here by P.A. Munz and I.M. Johnston on 27 July 1924, with a duplicate specimen as well. The original paper assigning that name to these plants is Bull. S. Calif. Acad. Sci. 24: 18, 19. 1925. Barbara Ertter realized that this was clearly a separate species from P. wheeleri var. wheeleri, due to its unique habitat, as well as a few morphological differences, when she was preparing the Jepson Manual treatment for Potentilla, and published the name of P. rimicola in Phytologia 71(5): 420 (1991 publ. 1992). This trail is the only known location for three species at SnJt: Cryptantha affinis; Collinsia torreyi var. wrightii; and Listera convallarioides. In addition, this trail may contain a fourth such species, Pyrola minor, if that is the actual identification for a small number of plants seen only as leaves so far. In fact, all of these species except the Collinsia are not present on any other trail we've surveyed anywhere in southern California. The following histogram gives the number of trails in our database that contain each taxon on this trail (not including the taxa seen only off-trail given at the end of the guide). We had 248 trails in our southern California database when this histogram was made; 13 of those trails, including this one, are in this area of San Jacinto Mountain. A number of "1" means the taxon has only been found on this trail among the trails in our database; numbers of "9" or smaller may indicate taxa found only in this area of San Jacinto Mountain. The numbers above all are just for the 7 Pines Trail area, not including the original Marion Mountain Trail portion. Beginning 7/13/10, the numbers include all taxa seen, including off-trail taxa. The work on 8/10/10 was just in the Listera drainage. The work on 5/4/11 was primarily to check for the present of Allium burlewii in the first mile or so of the trail. The work on 9/16/11 was just to mile 2.23, and was the first time the flora of the 8000 foot knoll was included. Although the species count stayed the same between 9/16/2011 and 9/21/2011, three species were deleted since they were not confirmed (Carex rossii, Lotus oblongifolius and Erigeron foliosus) and three were added (Agrostis scabra, Dodecatheon alpinum and Carex subfusca). The mileages in the guide come from Topo!. The total mileage is almost surely slightly underestimated, probably by no more than 10%, due to the tight switchbacks on the trail that are not accurately measured by that program. The elevations come from the topo map, and should be fairly precise. The guide below does not give most of the switchbacks and other such trail landmarks, since there were way too many of them to record. 0.00 Begin trail at northern end of parking area, at saddle between Fuller Creek and North Fork, elevation 6300 feet (1920 m), The following plants are at or near the parking area, given in alphabetical order by scientific name. 0.00 l Sign: "Seven Pines Trail; Deer Springs Trail 3.5 miles; Mt. San Jacinto 7.25 miles"
0.01 l Sign: "Fragile habitat; Creek Closure"
0.01 l Sign: "Wilderness Permit Required"
1.27 l Local high point; sign: "Entering Mount San Jacinto State Park Wilderness"
3.29 T-Jct. with PCT; highest point on loop; elevation 8640 feet (2633 m); go right; sign "(up): Little Round Valley 2.5; San Jacinto Peak 3.2; ((down): Strawberry Trail 2.5; Suicide Rock Trail 3.8; Banning Highway 6.3; (back): 7 Pines Trail"
Silene parishii. Only 18 plants are in the vicinity of trail, with the rest at the 8000' knoll. We thank Pam Pallette for her help with the 13 July 2010 fieldwork. Copyright © 2007-2013 by Tom Chester, Dave Stith, James Dillane and Aaron Fellows.